Yao Wu helped the City of Boston apply for grants and build a stakeholder engagement strategy around its pilot community microgrid project. The City of Boston and Boston Planning and Development Agency (BPDA) have been planning to develop a multi-user district energy microgrid system in the Ray L. Flynn Marine Park (RLFMP). 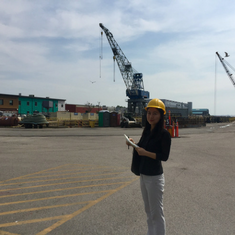 The BPDA enlisted EDF Climate Corps fellow Yao Wu to conduct stakeholder engagement in the marine park to educate tenants about district energy microgrid, collect information of the energy system of each facility and identify energy efficiency opportunities. These efforts will better prepare tenants and the project team for the potential feasibility assessment of the proposed microgrid sponsored by Massachusetts Clean Energy Center (MassCEC). Wu worked with the project team and BPDA’s GIS specialist to write the application to Mass CEC for a $75,000 feasibility assessment grant. Once submitted, she prioritized approximately 20 facilities in the RLFMP based on size, energy demand, industry and potential interest in the energy infrastructure. During the tenant outreach, Wu talked with facility managers and business owners about their energy systems and energy efficiency measures, which will assist with developing the scope of services for the feasibility study, if funded by Mass CEC. Lastly, Wu discussed alternative financing methods with a diverse audience. The City of Boston and BPDA sees the pilot as a promising approach to promote district energy microgrids as a strategy to address climate risks. This 10-week placement and its support of the grant application and stakeholder engagement will help involve potential customers of a district energy microgrid about the energy infrastructure. This outreach helps Boston understand the needs of marine park tenants which is key to securing their support for the project. If the grant application is successful, the funding secured will help the BPDA move the project forward. Yao Wu recently graduated with a master's degree from the Fletcher School, Tufts University. She is concentrating in energy policy and international business, and is passionate about clean energy and energy efficiency projects. At Tufts, Yao created a green labs program to promote sustainability in research labs and clinics.